RBNY vs Earthquakes: Breakout In Harrison! What a fantastic 2-0 victory against the Earthquakes! Dane Richards had a Man-Of-The-Match performance, shredding the San Jose defense time and time again, scoring a wonder goal and getting the assist on the second goal. And that second goal was scored by none other than Thierry Henry. Yes, TH14 finally broke out of his MLS scoring drought and tallied his first goal of the season. Merci vous dieux de football! Red Bulls fans can only hope that the living French legend (who, btw, is still taking the PATH to work) will start scoring in bunches, now that the proverbial dam has burst. Dane Richards' goal was also his first of the season, if you can believe it. I suppose that "Friendly Dane" tag (coined by the Seeing Red guys) might have to be dropped after this one. Richards has finally scored in a game that matters! If he continues to play like he did in this game, Dane might even get Mr. Backe to believe RBNY can win it all this year. Actually, the entire team is starting to really come together, and I, for one, firmly believe we'll be in Toronto on November 21st. Yeah, this could be our year! Besides Dane and TH14, there were several other stellar RBNY player perfomances in this game. Tony Tchani, for instance, was just a monster in the midfield. Tchani is really coming into his own and has really raised the coaching staff's expectations as a result of his recent performances (Rookie of The Year candidate?). Chris Albright continues to make his case for Comeback Player of The Year, as he's been National Team-like solid at Right Back. Rafa Marquez continues to dominate the midfield. Rafa not only did all the little things and made himself a calming presence in the midfield (where have I hear those before? ), but he was a genuine scoring threat when venturing forward. He's $5.54mil well spent. Next up for the Red Bull is a very tough trip to Rio Tinto Stadium and a game against defending MLS Champion Real Salt Lake. Let's hope that all of our guys are on their game, as they were yesterday. Please see the above video for the first part of our usual drunken matchday comments. You can click here for part II and click here for part III. A perfect day and a great victory to boot. Another great time in the Garden State Supporters section (133). The ESC and GSS were in fine form, yet again, and drove our team to victory. Please click here to see my photo set from this game, or click here for the slide show. Here's a great set from our friends @Chamber Images. Finally, here's the Official set from Red Bulls Official on Facebook. 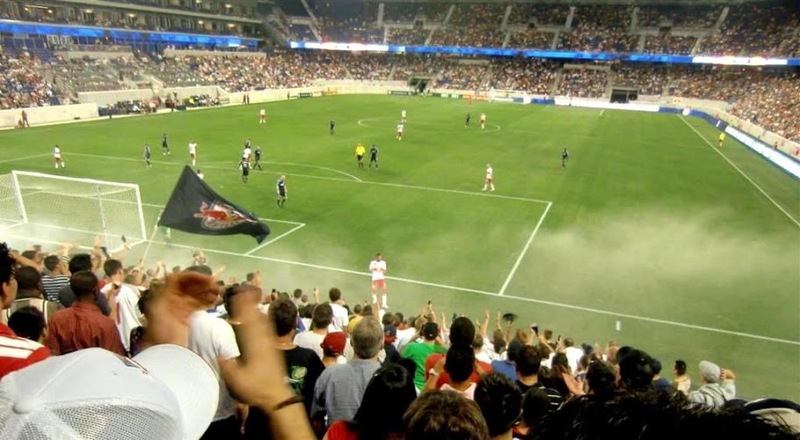 Hope to see everyone on September 11th, @The Cathedral of Football, for RBNY vs Colorado. Viper Out!